The last day of winter fades as the sun sets. In truth, it has been spring for a few weeks now with warm temperatures and wildflowers sprouting everywhere. No screech owl has showed up to nest – it should have happened by now. But the owl box is hardly empty; a pair of black crested titmice has decorated the interior with green moss and twigs, ready to settle in. I am disappointed, but not surprised. There are lots of other choice nest sites for a screech owl in this area: the greenbelt full of trees and several owl boxes in neighbors’ yards. 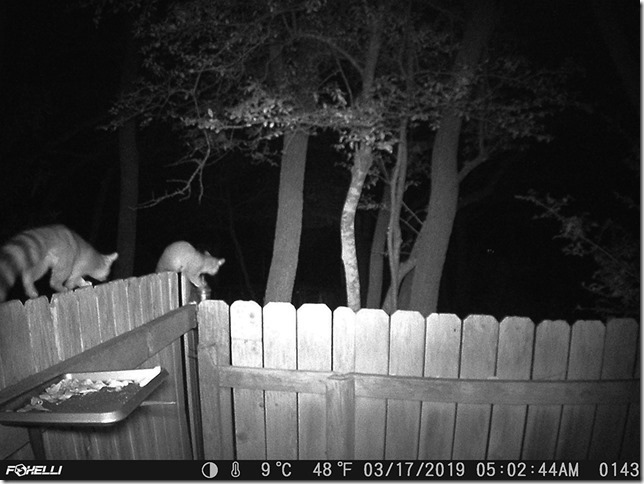 The ringtail shows up nightly and now there are two! 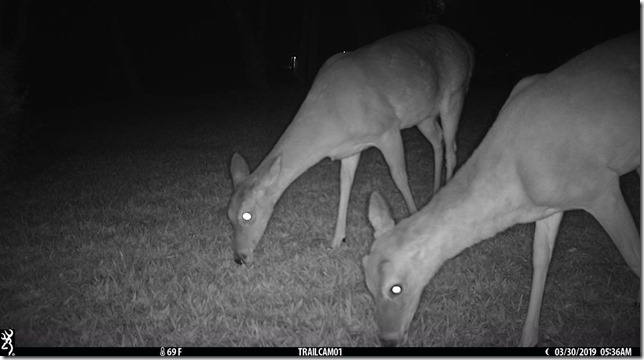 Tim’s sharp eye spotted the difference between two ringtails in photos, but it wasn’t until the trail cam caught two together that we were sure. In one photo they seemed to be chasing each other along the fence, their thick, fluffy tails waving behind them. It’s hard to determine if they are a pair, or siblings, or rivals. At any rate, we are lucky to have these little cat-like creatures in our yard. The bucks have finally begun to shed their antlers, leaving them with little knobs protruding above their eyes. On Saturday, I found a shed in the grass off the road while walking Daisy. I was so excited – I thought deer most likely dropped their antlers in the woods and I would never see one.